The debate about Russian interference in the 2016 election has focused primarily on what did they do and secondarily on how many votes did they change? Most self-styled “responsible” voices (see, e.g., here) hold that the Russian electoral interference probably did not swing the election (although also see here for a contrary view), and some have proposed that until we have evidence that voters changed their votes (or had their votes changed), we must remain skeptical that this interference mattered. There is an argument that we should consent to these responsible voices because doing so is our long term interests as a democracy, regardless of whether or not they are correct. The prospect that foreign election interference affected the outcome of the 2016 election should be frightening to everyone, and it might be better for American democracy to pretend that it never happened. But even so, the responsible views are unfortunate in two ways. First, they misunderstand* how Russian election interference could have mattered. Second, and consequently, they set the standard of proof unreasonably high, by holding that only evidence of voters “flipping” from Clinton to Trump constitutes evidence that election interference mattered. A better way to think through these issues would be to adopt a standard political science approach to vote choice, and to understand Russian election interference as about creating noise just as much as about persuasion. In doing so, it is very easy to construct a scenario in which Russian election interference had, on average, no effect on voters’ evaluations of a particular candidate, but swung the election anyway. Start with vote choice. The standard way to formalize a choice between two alternatives is to imagine that there is an issue that people care about (say, tax rates) and that voter has an ideal point , which is their most favorite policy from among all possible policies. Say that tax rates can range from 0 to 100, and voter ’s preferred tax rate is 25, whereas voter ’s preferred tax rate is 75. Now imagine two candidates offer two tax rates. DJT offers a tax rate of 10, and HRC offers a tax rate of 50. Voters compare proposals and vote for the one that is closest to their ideal point. chooses DJT, and chooses HRC. A way to represent this problem generically is by proposing that voters have a utility function: . This just tells us that for any policy , the further it is from the voter’s ideal point, they less happy they are with the policy. This example uses a quadratic loss function but there are many other ways to do it. So when comparing two candidates, DJT and HRC, and , and the voter chooses DJT if . Here, I’ve added the term to represent a random error** that the voter makes in assessing their utility from each proposal, but this does not matter much for what follows. All this means is, compare the proposals from the two candidates and choose the one that gives you the higher expected utility. A lot of what the trolls did seemed to have no political import at all—it was noise, from which the authors of the reports isolate certain comprehensible messages. But, to a large extent, pure noise was the point. We can add this into the account above easily. Specifically, let us imagine that there is some uncertainty added to one of the candidates, not the other. So , where is an uncertainty term . Now, instead of comparing HRC’s actual position to their ideal point, voters compare HRC’s position measured with some error to their ideal point. Written this way, the average effect of electoral interference on any individual voter is zero: in expectation, the interference pushes just as many people to think that HRC is further to the left as to think that HRC is further to the right. 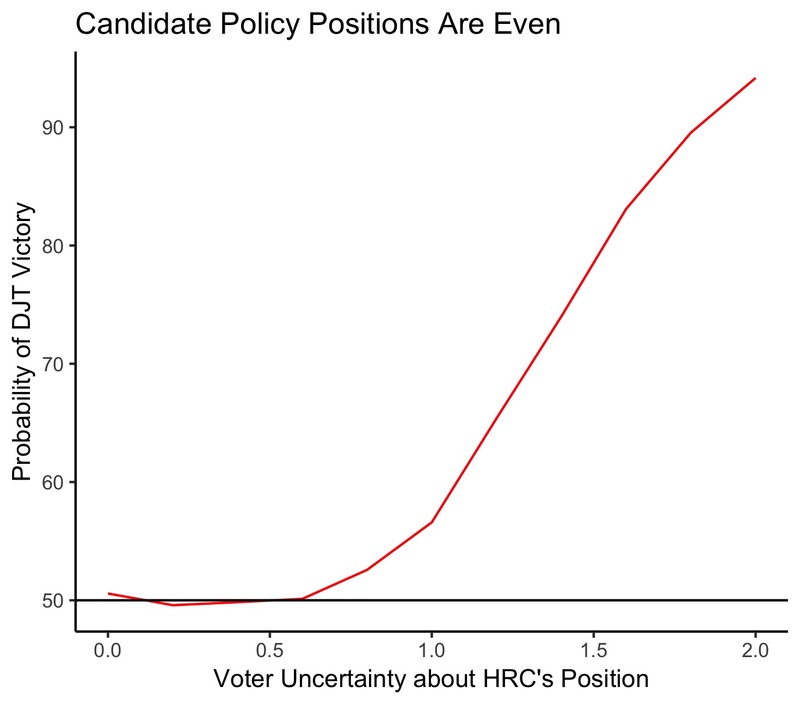 And it does not change anyone’s ideal policy point, it just changes his or her evaluation of where candidate HRC sits relative to that ideal point. So no one’s mind has changed, no one’s preferences have changed, and the average effect of the intervention is zero. All that happens is that voters are more uncertain about HRC’s true position. Below I simulate the outcome of such an election for a hypothetical population of 1000 voters, for different values of , with 10,000 simulations each. The larger that is, the more uncertain voters are about HRC, and when they are not uncertain at all. 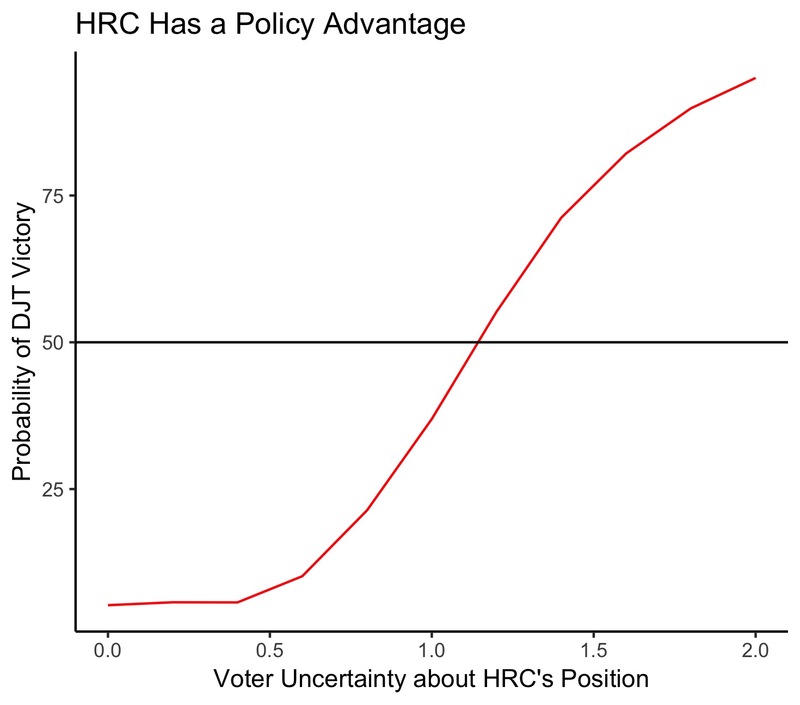 We learn from this exercise that as uncertainty about HRC increases, the likelihood that DJT wins increases from a 50% chance to almost 100% chance. Now let’s change the simulation just a bit, from a world in which HRC and DJT had an equal chance, to one in which HRC had an advantage. Voters are still arrayed along the same single dimension from -10 to 10, but now HRC sits at 0 and DJT sits at 1. Because HRC is at the middle of the range of voters, and DJT is not, she will receive more votes: all the votes to her left, and half of those between her and DJT, who wins the other half plus all the votes to his right. If we add uncertainty as before, look what happens. We have gone from a situation in which HRC was almost certain to win to one in which DJT is almost certain to win. All this just from making voters more uncertain about HRC’s position. Here we have constructed a simple example where merely increasing the uncertainty about HRC’s position can swing the election to DJT, even when it changes no one’s preferences. It is possible to explore these and other models in myriad different ways. For example, you could add uncertainty to DJT too; these results will hold just so long as there’s more uncertainty about HRC than for DJT. Or, you could actually change the average beliefs about candidate positions (not just the uncertainty about one candidate’s position). But this simple approach clarifies just how easily electoral interference could have changed the outcome of this hypothetical election, even if no one’s preferences have changed and the average effect across voters is zero. And this is how we ought to think through whether Russian electoral interference may have swung the election to DJT. *** We are of course ignoring the random shocks but because they are symmetrical across both candidates this does not change any conclusions.